Mommy, Can I Lick the Spoon? 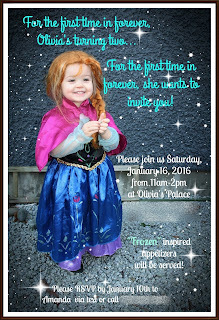 : Olivia's Birthday Part Two: The Frozen Party! As I mentioned last week, Olivia celebrated her second birthday on January 12th. In our house, it's still all about Frozen - Lauren loves Elsa and Olivia loves Anna. 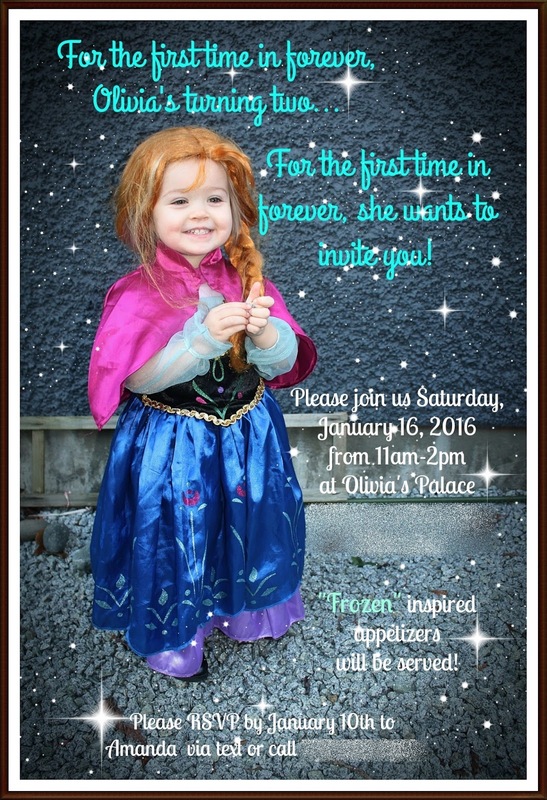 Because of her love for Anna, we threw her an Anna/Frozen birthday party. The birthday girl and her big sister (dressed as Elsa). I love planning parties and spend way too many late nights perfecting every last detail. And even though this was a small party, I still spent many late nights working on it. This post contains LOTS of pictures...you've been warned! We've been making our own invitations and thank you cards for a little while now, I think we started when Lauren turned two. It's one of my favorite things to do. I may not be a pro, but it's so much fun making them! For the food, I made Frozen inspired appetizers. I got some cute food tents and water bottle labels from ErikasPaperCreations on Etsy that were super easy to customize. All of the food was labeled with lines or quotes from the movie, or something related to Frozen. Some of things we had for the fountain were, marshmallows, pretzels, Ritz crackers and strawberries. But when it came to the chocolate fountain, pretty much anything went! This was the first doll cake I ever made and I am so proud of it! It turned out exactly how I wanted it to. My freehand piping (flowers) skills need a little work, but overall, that's not a big deal. I made my usual pink lemonade cake with buttercream. I used the Wilton Wonder Mold Kit, and two 8' round cakes. The reason I added the two 8 inch cakes was because the Anna doll was a full size doll (12 inches, I think) and the doll cake pan was only 5 inches deep. It ended up being a big, heavy 3 layered cake! I tripled the recipe to have enough to fill all three cake pans. Preheat oven to 350 degrees. Prepare cake pan(s). Combine all of the ingredients in an electric mixer and begin by mixing low for 30 seconds, then increase the speed to medium for another minute. Pour batter into cake pan(s). Bake for about 25 - 30 minutes, or until cake tester comes out clean. The 8 inch cakes took about 30 minutes to bake and the doll cake pan was about 35 minutes. Allow to cool before decorating. Dissolve the salt in the cream and stir. Beat butter until slightly fluffy. Add icing sugar, one cup at a time, beating well on medium speed. When all sugar has been mixed in, icing will appear dry. Gradually add cream until light and fluffy. If icing is too thick, add more cream 1 teaspoon at a time. Mum and daughter both are looking really cute. I am glad you shared about this party here. My daughter also love frozen parties and for her upcoming birthday I am thinking to plan it at venues in NYC. Please share some more photos from party, so that I can take an idea to plan my party well.